A brain-damaged man, trapped in a coma-like state for six years, has been brought back to consciousness by doctors who planted electrodes deep inside his brain. SYDNEY: A brain-damaged man, trapped in a coma-like state for six years, has been brought back to consciousness by doctors who planted electrodes deep inside his brain. The method, called deep-brain electrical stimulation (DBS) has successfully roused communication, complex movement and eating ability in the 38 year-old American man who suffered a traumatic brain injury and for six years showed few signs of recovery. His injuries left him in a ‘minimally conscious state’ (MCS) – a condition akin to a coma but characterised by occasional, but brief, evidence of environmental and self-awareness that coma patients lack. It’s thought to currently afflict up to an estimated 300, 000 patients in the USA. The remarkable new technique is reported in today’s edition of the British Journal Nature and suggests that some MCS sufferers simply lack treatments that might help the brain restore consciousness. If the results are more widely replicated, then the care given to MCS patients could change substantially from the custodial, rather than restorative, care most currently receive. “We hope that [this]… marks the beginning of a significant period of innovation in our approach to traumatic brain injury,” said Ali Rezai, the paper’s lead author and Director of the Cleveland Clinic Centre for Neurological Restoration in Ohio. Treatment using DBS – already a widely accepted treatment of epilepsy and Parkinson’s disease – focuses on the idea that changes to neural circuitry in the brain can treat some disorders in place of medication. The U.S. patient detailed in the new study had failed to recover the ability to follow commands or communicate after receiving irreparable damage to his cerebral cortex – responsible for a vital role in consciousness, awareness and attention – despite functional brain scans that showed preservation of a large-scale language network. The research team believed they could ‘switch on’ the undamaged areas of the brain by amplifying existing low-levels of activity they knew still existed, with electrical impulses. To do this, they implanted pacemaker-like DBS electrodes in the central thalamus, a region that plays a key role in regulating sleep and consciousness. 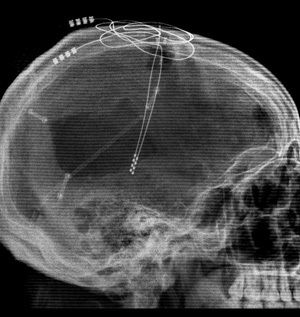 After allowing the patient to recover from surgery, doctors sought to find the most effective pattern of stimulating the brain with the implanted electrode. By balancing periods of electrical stimulation with intervals where no stimulation occurred, researchers were able to effectively measure the effects of the stimulation. An animation of deep-brain simulation – also known as a ‘brain pacemaker’ – tiny electrodes are implanted within the brain and connected to a pacemaker battery in the chest. (Credit: Cleveland Clinic). Within days of the electrode implant, the man demonstrated increased arousal, sustained eye opening and head turning in response to voices, the ability to name and use objects. The patient’s state of arousal was highest when stimulation occurred, but continued to remain high afterwards, and did not return to his unresponsive state. “The results were dramatic”, write doctors Michael Shadlen and Roozbeh Kiani of the Howard Hughes Medical Institute in Seattle, in an accompanying Nature commentary. However, they note that this early stage of research only reports on a single case and further study is needed to understand the spectrum of brain injury that may benefit from the treatment. Sign up to our free newsletter and have "This Week in Cosmos" delivered to your inbox every Monday. Copyright © 2014 COSMOS Media Pty Ltd. All rights reserved.